From the equalization formula, and the ever increasing burden put on Alberta to provide, quite lavishly, for other provinces, such as Quebec, while still not getting any semblance of fairness in what they receive in return, to the pressing matter of Alberta being able to move it's most precious natural resource, which is oil, to market. 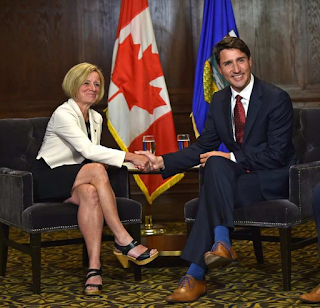 It seems as though Alberta is surrounded on all sides, and in all honesty is currently run by, enemies of it's prosperity. Saskatchewan stands out as an exception, and beyond sharing a border with Alberta, is also second to Alberta in total oil production. 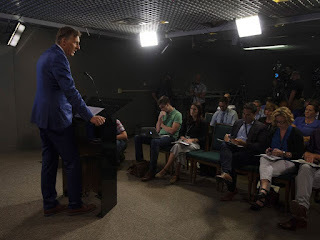 The government of Saskatchewan has also stood in solidarity with Alberta, in the fight to get her natural resources flowing. The former mayor of Montreal, Denis Coderre, was glad to take partial credit for, and laud in the defeat of the Energy East pipeline, which would have brought Alberta oil to the east, with benefit for the Alberta economy, and that of Quebec...but the only beneficiary in the needless stoppage of that project turned out to be Coderre's ego, which seems about as toxic as his own hypocrisy, or perhaps as toxic as the sewage he let flow into the St. Lawrence River. The current Premier of Alberta, Rachel Notley, as well as Prime Minister Justin Trudeau, seem to be doing nothing but stalling, on getting the now federally owned, to the tune of 4.5 billion dollars, unfinished, Trans Mountain pipeline completed, with an estimated 9.3 billion dollar price tag upon completion, according to an article from the Financial Post. From all the protests in British Columbia, where the pipeline must pass through, as well as opposition from the BC NDP/Green party coalition government, to the recent court decision to halt any further construction on the project...it seems as though all of these impediments work toward what Premier Notley, as well as Prime Minister Trudeau ultimately wish to see...and that would be the entire project dead in it's tracks, as neither of them have ever had any real interest in the serious development, and or movement of natural resources...but both have a keen interest in their political futures, and are preening and pandering to show concern in getting the pipeline built. Again, if she was sincere in standing up for Alberta, and the Albertans she claims to represent, then she could've really shaken Trudeau's cage, and threatened to withhold transfer payments from Alberta, until the feckless Trudeau decided to exert real federal pressure in getting Trans Mountain moving forward...which again I feel he has no real interest in doing...at least anytime soon. He could've just as easily said that as Premier of Alberta, he would halt transfer payments, sans a referendum, if the desire to really take a stand for his province was there, as well as presenting the federal government with a clear ultimatum, and a real challenge on behalf of Albertans who are struggling, and looking for strong representation, along with a way out of the mess that the NDP government, and Premier Notley, have made out of the province. Perhaps Mr. Kenney might harden his stance, as the election of next year fast approaches...or at least I hope he does. So much more could be said on behalf of Alberta, and what the province has really been through, both past and present, but I do hope the above at least provides a bit of a snapshot of what Alberta, and Albertans, are facing currently, and some of the messiness they are in the middle of, which I find both maddening, and heartbreaking at the same time. 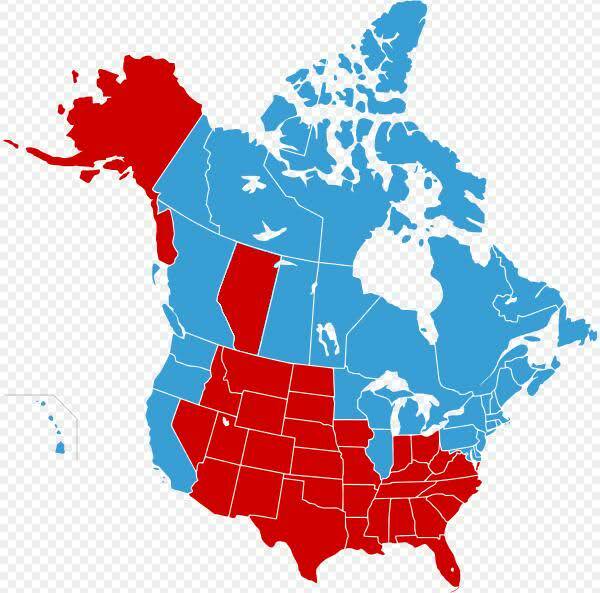 An Albertan friend of mine once suggested to me that should Alberta join the U.S., then it could be absorbed by it's neighbor across the border, as well as the state where I was born and bred, and that would be Montana. In so many ways, Alberta and Montana are a reflection of each other, in both natural, picturesque beauty, as well as socially, culturally, and with economies both based in natural resources. Should that be the manner in which Alberta would join, then I would simply be that much prouder to call myself a Montanan. Recently, I happened across a list of 51 reasons Alberta should become a U.S. state, which can be found here . I agree with many of them, and went through and chose a few that particularly jumped out at me. Second Amendment rights would belong to every Albertan, and I believe many Albertans would look at that as a very important benefit, both rurally, and in the urban areas, and a welcome change from the current, draconian gun laws of Canada, which may get even more draconian than they currently are. No more ATT permit would be needed to simply go to the shooting range, with what once would've been classified as a restricted firearm. First Amendment rights would also belong to every Albertan, which I'm sure would be embraced, in light of the lack of and punishment of free speech, which frighteningly is the vision of the current Liberal government, in the form of M-103, and it's sponsor, Liberal MP Iqra Khalid. Protection of the U.S. military, in an increasingly perilous world, would also belong to every Albertan. Technically, Canada has the protection of the U.S. already, through NATO, but that may or may not always be the case, should President Trump withdraw the U.S. from NATO, assuming other members fail to pull their weight. The free flow of Albertan natural resources would also result from statehood, as well as an increased industrial diversification...which would add up to much needed jobs. Again, those are but a few from the list, but I invite anybody to check out the rest of them, and decide for themselves. As an American, I am fully behind Alberta. If joining the U.S. is how Alberta would ultimately be revived, then I wouldn't be opposed at all. Ultimately, I would be in favor of whatever brings that amazing, yet beleaguered province the economic relief, social freedom, and proper representation that is so desperately needed. 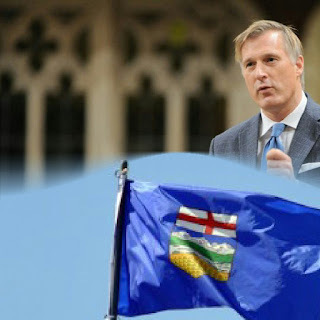 I could see confederation as being workable for Alberta, should she be represented fairly, and that might very well come, at least on a federal level, through the encouraging rise, and hopeful success of Maxime Bernier, and the PPC next year. There is a link here to the PPC homepage, and I would encourage anyone to view the party platform. God Bless and keep Alberta.